Fill the basket with salad or vegetables, replace the cover and pull the cord several times, the stronger the pull the faster the spinning motion. Removes excess water from the contents rapidly. The transparent container serves as a salad bowl. 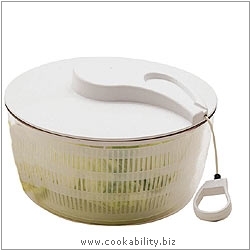 Drier basket can be used as a colander for hot pasta etc.